Marvin Kaye said he was taken aback when, last weekend, he was told he’d have to use self-checkout at a Shoppers Drug Mart in Ajax, Ont. After protesting, Kaye said he was told he could go to a cashier — if he paid cash. He had none, so that option was out. “I find it distasteful that I can’t even get that basic level of customer service,” said Kaye, who grudgingly used the self-checkout machine to pay for his purchase. Many large retailers are adding self-checkout machines to stores, claiming they’re offering more choice. But several Shoppers Drug Mart and Real Canadian Superstore customers complained to CBC News that they were recently given only one choice: self-checkout. well, it wasn’t tonight. I asked for the regular cash and was told unless I was paying cash I had to use the self check-out. If what you stated is your policy, the employees at the Shoppers I was at need a policy review. Each Shoppers Drug Mart customer relayed the same experience: because they were paying with debit or credit, they were ordered to use the self-checkout machine — which accepts cards but not cash. 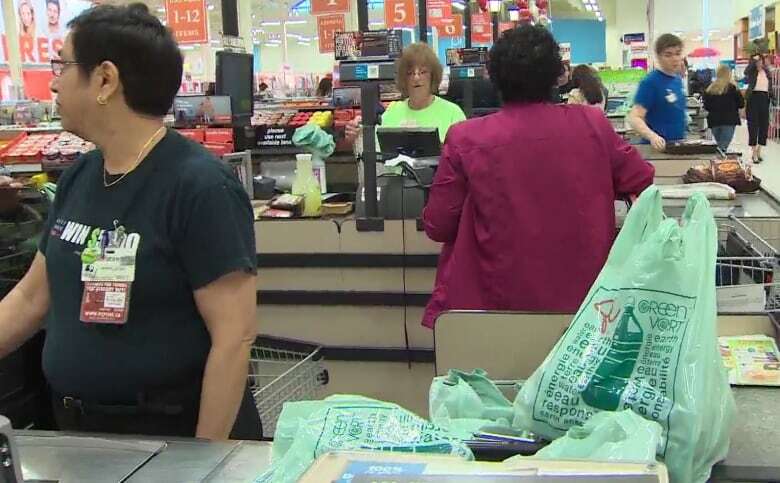 “They’re forcing me to use it and I don’t think that’s fair,” said Linda Chaikowski, who was directed to self-checkout last week at a Shoppers in Winnipeg. Nancy McCurdy said she was also forced to use the machines this week at a Shoppers in London, Ont. “I hate these new blasted self-checkouts, because they talk to you and I can’t figure out what they’re saying,” said McCurdy, who is hard of hearing. 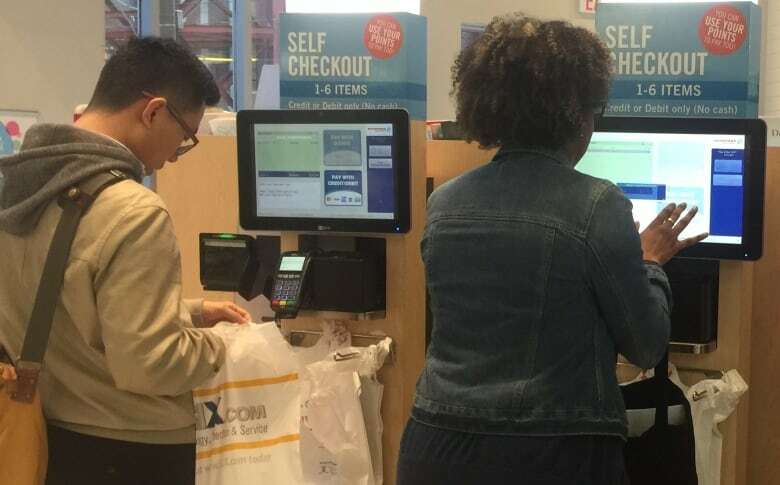 Marvin Kaye, the Shoppers customer in Ajax, Ont., suspects the retailer is pushing self-checkout as a way to save on labour costs — a saving he suggests should be passed on to customers. Loblaw Co., which owns Real Canadian Superstore and Shoppers Drug Mart, said it expects stores to always give customers the option of checking out with a cashier. “We’ve now heard from a few customers that some [Shoppers] stores are encouraging those using credit or debit to use self-checkout,” said spokesperson Catherine Thomas in an email. Customers have also complained they were not offered a cashier option at grocer, Superstore. Kerri-Lynn Parker said that around 10 p.m. last Sunday, there were no cashiers open at her Superstore in Edmonton, so she was told to use a machine. 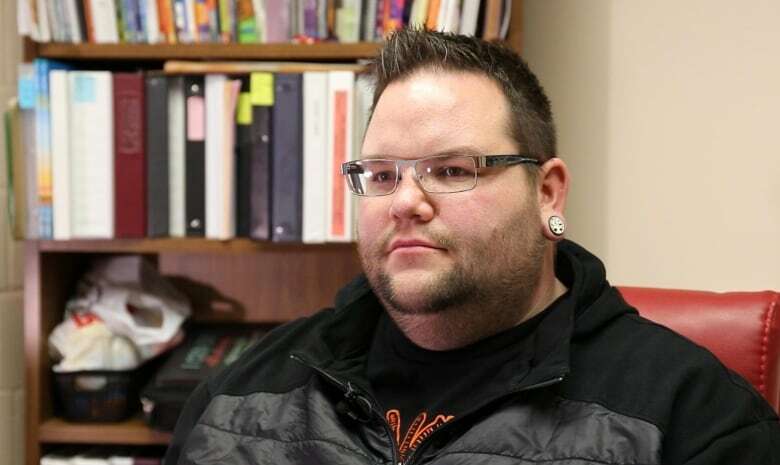 “[An employee] said, ‘We will help you.’ And I said, ‘Nope,’ and I dropped my basket and I walked out,” said Parker. Jared Gossen said he also discovered no cashiers on staff early Friday morning, both this week and last, at the Superstore in Grande Prairie, Alta. On both occasions, Gossen had a cartful of food for a weekly breakfast program he runs at the St. Lawrence Centre drop-in shelter. He said he got help scanning his items at self-checkout, but was upset to learn from an employee that the store would have no cashiers from 7 to 9 a.m. every day. “So, virtually now, I work for Loblaws for free,” said Gossen. Loblaw said there should always be a cash lane open for Superstore customers. “We are sorry to hear about these stories and have reached out to stores to clarify our expectations,” said spokesperson Catherine Thomas. Shoppers and Superstore aren’t the first stores to face accusations of mandatory self-checkout. In November, CBC News interviewed two Walmart customers who complained that no cashier lanes were open at their local store during certain hours. Walmart Canada said its goal is to have a cashier available at all times. Toronto retail consultant Bruce Winder said retailers often experiment with different ways to cut costs. But he believes mandatory self-checkout is one experiment that won’t stick because, while some people love using the machines, other customers detest them. The two Walmart customers said their store now appears to have backtracked on not providing cashiers at certain hours. And Linda Chaikowski, the Shoppers customer in Winnipeg, has reported that during her most recent visit this week to the same store, she was allowed to pay at the cashier using her debit card. “I’m glad they’re changing it and realizing that there’s an issue,” she said.